A lot of the misconceptions about women and strength training have been all but debunked. 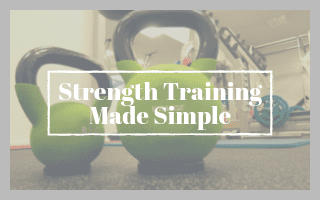 But there’s still a lot of confusion about why strength training is so important and how to get started. This article will simplify those things and provide you with a beginner workout to get started. The medical definition of strength, or resistance, training, is a system of physical conditioning in which muscles are exercised by being worked against an opposing force to increase strength. Can help increase metabolism because muscle has higher energy demands than fat. Helps improve mood, relieve stress and anxiety. Helps manage & improve quality of life for lots of conditions such as arthritis, osteoporosis, Parkinson’s, just to name a few. For beginners, 2 total body strength workouts per week is a great place to start. Total body workouts allow you to challenge all your body’s major muscle groups, which is important for overall strength, balance, and injury prevention. As you get more familiar with this type of exercise and improve your fitness, consider working up to 3-4 days of strength training. Spread your sessions out throughout the week so that your body has time to recover between workouts. If you’re strength training 3 times per week, these can still be total body sessions. 4 workouts per week can be split into 2 for the upper body muscles and 2 for the lower body muscles. Non-strength training days don’t have to be complete rest. You can do steady-state cardio or interval training on those days or focus more on recovery with a yoga class or leisurely walk. A great place to start is using your own bodyweight as resistance. You won’t need any equipment, just a patch of floor big enough to lie down. Even the most advanced athletes incorporate bodyweight training into their workouts so it’s possible to challenge your muscles even if you’ve been training for years. In this Bodyweight Exercise Workout Program, I’m showing you 7 exercises that you can mix-and-match to put yourself through a total body workout no matter where you’re starting. Each exercise links to a demo video and gives you some options to make it harder or easier, depending on your strength level. It’s totally fine if your bodyweight feels like enough – or even too much – of a challenge for you. You will get stronger and more capable with each workout! Start with 2-3 sets of 8-12 reps of each exercise. Once the upper end of that range doesn’t feel like too much of a challenge, progress to a harder variation. In order for strength training to benefit you long-term, your workouts need to continue challenging you. For muscles to grow, gain strength, or perform better at specific tasks, they need to be taxed beyond what they’re used to. This is referred to as the progressive overload principle and it explains why you see some people at the gym for years on end, doing the exact same workouts and looking exactly the same. In order to progress, you must place your body under increasing demands. It’s not as hard as it might sound. You can increase the amount of weight you’re using or, if you’ve been doing bodyweight exercises, add external resistance to the movement. An example here would be to progress from a bodyweight squat to a squat holding a kettlebell at your chest. Another option is to increase the number of times that you do the movement (called reps, see below for helpful terminology) at the same weight. This will increase your total workout volume. Other options are to rest less between sets or slow the movement down so that your muscles are under tension for longer. Using this Bodyweight Exercise Workout Program, an easy way to progress your workouts is to utilize one of the more advanced variations of the movements, as you are able. Doing so will allow you to create a 4-8 week program just using the free program! Rep: Short for repetition. One performance of a single exercise. Set: Number of reps performed in a row without rest. Tempo: Speed at which one rep is performed. Superset: 2 exercises done back-to-back with no rest. Circuit: 3 or more exercises done in a row with little or no rest. You’ll do 1 set of each exercise in the circuit before starting again with the first exercise to begin the next round. Dynamic Warm-up: A series of sport-specific movements designed to help prepare the muscles for performance. To be completed in a safe and controlled fashion at the beginning of your workout. Compound exercise: An exercise that engages 2 or more muscle groups. Barbell: A long metal bar to which disks of varying weights are attached at each end. Dumbbell: A short bar with a weight at each end, used typically in pairs. Kettlebell: A large cast-iron ball-shaped weight with a single handle. Resistance Band: An elastic band used for strength training. Cool-down: Complete workouts with a 5-10 minute cool-down and stretch. Try walking slowly on the treadmill or around the neighborhood until your heart rate goes down, followed by foam rolling or static stretching. Form first: Performing exercises with good form is paramount. Don’t worry about increasing weights until you feel comfortable executing the movements with a lighter weight or bodyweight. Utilize my YouTube channel for exercise demos to double check your form. Progress when able: Increase the weight you use in small increments until you are no longer able to complete the desired reps with good form. You want the last few reps of the set to be challenging but not impossible. Push yourself whenever possible. Listen to your body: If something doesn’t feel right, don’t push it – your body is usually trying to tell you something. If you’re unfamiliar with strength training and feel unsafe getting started on your own, consider finding a personal trainer or coach to help you get going. A local trainer can help you in person but may be more costly than an online trainer (& weight loss coach like myself) who will be able to work with you remotely. Remember, you are not going to need this person for all of eternity. A good trainer will help you build the skills and confidence that you need to incorporate strength training into your lifestyle.